My nails aren't the best looking ever, that I will admit. I cannot do gels or acrylic because my nails are so weak that they bend and bruise after a week and a half! The only solution was "Glue on" Nails which I was sporting for a couple of weeks. 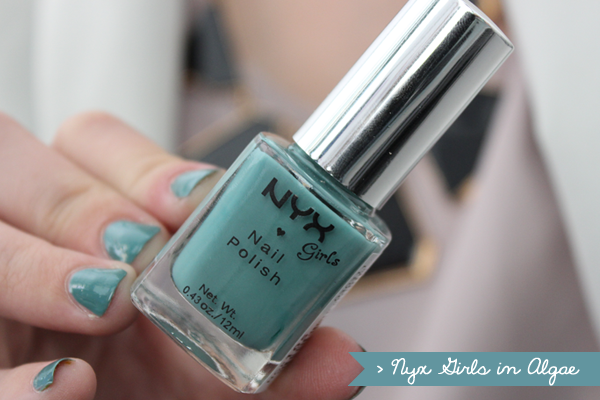 I decided to give my nails a breather but still paint my nails with this gorgeous yet unusual shade that NYX kindly sent me in the little goodie bag to test and play around with. 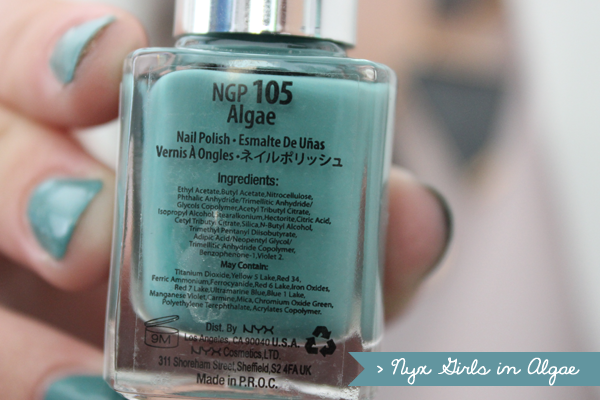 NYX Girls Nail Polish in Algae £2.50 / €2.95 This to me is a Grey Green shade that reminds me of a dark teal. Something I must say is that it's very sheer. All bumps seep through the polish which i was a bit disappointed. I was very happy with the drying process as the polish did dry within 2-5 mins and dries with a glossy finish so there wasn't the need to apply a Top Coat afterwards. Overall, for the price it is a very good "cheap" drugstore brand that offers a wide range of colours. I personally wear bright colours or pastels so this wouldn't be a colour I would wear very often even though I would say this is a more Winter/Autumn colour in my eyes. HAVE YOU TRIED THEIR POLISHES? Very pretty color! :) Awesome for summer, check out my blog if you get a chance! !